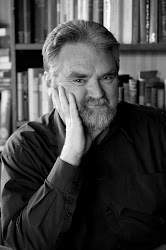 If you have been aware of this blog for a while, you will probably know my track record when I deal with one of the great masters of English literature in this “Something Old” section. I tend not to deal with the works for which that particular author is best known, but with the ones that are either disregarded or seen as lesser fare. Partly this is because I do not wish to bore you by telling you what you already know. Partly it is because, after all, I have not read all the language’s masterpieces. And partly, because the more obscure books seem the ones most worth bringing to light. So when I broach Joseph Conrad, I deal not with the undoubtedly great stuff like Lord Jim, The Secret Agent or Heart of Darkness, but with Victory (look it up on the index at right), which I personally regard as a failure. Likewise, in dealing with Thackeray I don’t deal with Vanity Fair, but with the much under-rated The Newcomes (look it up ditto). As for Henry Fielding, I’ve so far had a whack on this blog at his Joseph Andrews, Amelia, Tom Thumb and Journal of a Voyage to Lisbon (index ditto for all of them), but have left Tom Jones out of play. Of Dickens, I’ve commented only on his Christmas Books and The Old Curiosity Shop (index ditto) even though I’ve read nearly all his corpus and know he wrote greater things than these. This doesn’t mean that at some future date I won’t deal with the acknowledged masterworks (especially if I am beginning to run out of material to cannibalise from my reading diaries!). It just means that for the moment I have more fun dealing with the various authors’ less celebrated stuff. Which, after all this hemming and hawing, brings me to Mary Anne (‘Marian’) Evans dit ‘George Eliot’ (1819-1880). Of course I acknowledge that Middlemarch is her greatest novel, often called the greatest in the English language. Of course I enjoyed reading Adam Bede, with its affectionate portrait of an eponymous character based on Eliot’s father, even if the rest of the plot of that novel is rather shaky. I know that Silas Marner was once hammered to death as a safe text for schoolchildren, but I still enjoyed it, melodrama and all. (Oh the too-neat punishment of the thief! Oh, the too-patterned redemption of the miser!) I once made the mistake of reading The Mill on the Floss in its unedited entirety out loud to my older children, and managed to bore them rigid, although they and I still found the bond between Maggie and Tom Tulliver affecting and not to be sneered at. At this point, for completion’s sake, I have to admit that I’ve never read Eliot’s Felix Holt or her philo-semitic novel Daniel Deronda, although (ahem!) I have seen and enjoyed with my family a very good BBC television series adaptation of the latter. These two last-named novels nevertheless sit on my shelves shaming me for not having read them. 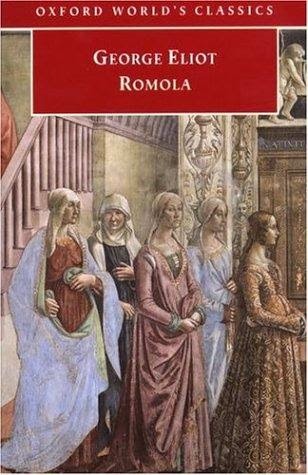 But, unlike most readers of Eliot, I have actually read George Eliot’s only bona fide historical novel, Romola. And thereby hang a number of tales. I was first attracted to this Victorian novel because I was studying church history at the time and I wanted to know more about Girolamo Savonarola. I read a number of biographies and histories of the man (Michael de la Bedoyere’s The Meddlesome Friar is still a good starting point, even if it was published way back in 1957) and I noted that a number of them mentioned Eliot’s novel as an interesting Victorian perspective, even if not to be trusted too much as history. So I read it, in the closely-printed 600-odd pages of the old Nelson and Sons hardback that still sits on my shelf. I quite enjoyed it, too. I already knew the general reputation of this novel. It was seen as an aberration into historical romance from an author who was better suited to stories of contemporary society (a bit like the reputation of Flaubert’s historical novel Salammbo after his masterpiece Madame Bovary). It was also seen as a novel with such an impossibly high-minded heroine that she was seen as somewhat incredible – the type of paragon put forward to inspire well-behaved Victorian girls by their right-thinking parents. Two or three times I had the pleasure of teaching George Bernard Shaw’s Major Barbara to senior high-school classes. It is a play which also has a high-minded heroine, but Shaw includes in it a joke at the expense of Eliot’s novel. There’s a scruffy, rumpled and dishonest Cockney woman who goes by the name of ‘Rummy’ Mitchens and who seeks help in a Salvation Army shelter. When another Cockney character asks her about that name ‘Rummy’, she says it is really ‘Romola’, and “It was out of a new book. Somebody me mother wanted me to grow up like.” In 1905, when Shaw’s play was first produced, sophisticates would have snickered at that one as Romola was already over forty years old and already seen as a piece of outdated and righteous moralising which only the lower classes would still see as acceptably highbrow. The novel is actually better than that, but its reputation is understandable. It is set in late 15th century Florence, at the time of the decline of the Medici and rebellions against them, the wars with French kings like Charles VIII and, more centrally, the influence and reforming zeal of Savonarola. Eliot apparently spent some years researching assiduously the novel’s setting in time and place – including making a number of trips to Florence. This shows in the long and detailed descriptions of buildings and art-works that pepper the text, which are not always an asset in a novel. Quite a number of historical figures feature as characters – not only Savonarola and Charles VIII (displayed in one chapter passing through Florence with much pomp and splendour when the Medici are expelled); but also Niccolo Machiavelli, depicted as a witty and cynical young man who has not yet been soured by events; and the painter Piero di Cosimi, who becomes the novel’s representative of Renaissance art in his torment over whether he should stick to religious art or deal with secular subjects and commissioned portraits. The central characters are, however, Eliot’s fictions. Romola is the virtuous and dutiful daughter of the blind Renaissance humanist scholar Bardo de’ Bardi, whose lifelong ambition is to keep together his library. At one point in the novel, Piero di Cosimi paints the daughter as Ariadne and the father as Tiresias. Old Bardo dies about halfway through the novel. Romola’s brother Dino is a friar, Fra Luca, who has deserted humanist scholarship to live the life of a penitent. Fra Luca dies about a quarter of the way through the novel, but not before having a prophetic vision which indicates disaster for Romola. The disaster turns out to be Romola’s marriage to Tito Melema, a facetious and successful young Greek scholar who gains public position in Florence on the expulsion of the Medici. Step by step, the superficially attractive character of Tito proves to be very flawed. Not only has he forsaken and left in slavery his loving adoptive father (who – neatly – ends up as his nemesis); not only is he involved in the sleaziest sort of politics simply through his lust for power; but he consistently cheats on Romola. He has made a second “marriage” with the pretty, innocent, empty-headed young peasant girl Tessa and is in effect keeping her as his second wife. As it is structured, the novel is an intellectual “quest” story. 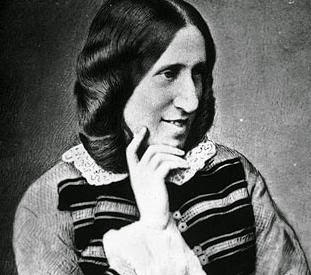 Its implicit central question seems to be “What is a worthy and rightful object for a woman’s sense of duty?”, a question which exercised George Eliot more than once. In its three broad sections, Romola’s story represents the progressive stripping away of unworthy (or incomplete) objects for duty. Then there is her wifely sense and fidelity to her husband. But she discovers first that Tito has not kept faith with her father’s express wish (to keep his library together) and then that her marriage to Tito is a sham anyway. Finally, there is Romola’s adherence to Savonarola’s reforming zeal. This is the most satisfying and attractive of Romola’s “temptations”, but again it is found to have its limitations. Savonarola’s wish to reform a corrupt state and a corrupt church is shot through with fanaticism. Romola also discovers that Savonarola’s idealism is mingled with personal pride and compromised by power politics in the city-state. (Eliot’s ambiguous judgment of Savonarola is best expressed at the end of Chapter 25, where she discusses the mixed effects of his preaching.) Savonarola is on one level an enemy of vice (in which particular both George Eliot and Romola agree with him). But as he attacks and makes a bonfire of “vanities” he is also the enemy of humanist scholarship and art. When Savonarola allows Romola’s godfather, the scholar Bernardo del Nero, to be sacrificed for the sake of political stability, Romola loses all faith in him, succumbs to despair and attempts suicide. She hops into a boat which she hopes will carry her down the Arno to the sea, where she can drown. (In doing this, she is copying the actions of a character in Boccaccio’s Decameron.) Instead, the boat strands her in a village stricken with plague. Here live Tessa (the faithless Tito’s other “wife”) and her family. Romola at once realizes what her duty is. It is to relieve the suffering of her fellow human beings. So she settles into a life of looking after Tessa, whom she sees not as a rival but as another innocent woman who has been exploited. Although it may sometimes be painful, selfless altruism is the final rightful object of one’s duty. I’ve sometimes noted that some 19th century works of literature anticipate what we think of as 20th century perceptions. (Robert Browning’s Childe Roland To the Dark Tower Came, with its desolate landscape, has always seemed to me a foretaste of T. S. Eliot’s The Waste Land). I’m therefore not squeamish about saying that Romola reminds me of an existentialist fable. Only when the void is faced, when reliance on the moral compass of others proves inadequate, can one find a true object for faith and a life’s work. Romola has to be brought to a position of despair, of seeing everything as pointless and valueless, before she can discover true value. Unlike the mid-20th century existentialists, however (Camus, Sartre and company), George Eliot sees us as having an innate sense of duty (conscience? ), this being perhaps a survival of the evangelical Christian faith she had abandoned. The novel’s secondary matter is its depiction of the Renaissance, and about this George Eliot is curiously ambivalent. Renewed scholarship is seen as virtuous and positive in comparison with medieval scholasticism, but (and you can read this in Chapter 7) Eliot is aware of how petty and self-serving scholarship can become. Savonarola’s urge to reform is approved, but Savonarola is both marred by fanaticism and too good for his followers who miss the point of his mission and expect him to perform miracles. Textbook fashion (all those descriptions cluttering the book! ), Eliot acknowledges the achievements of Renaissance art, but clearly sees Renaissance revelry as unpleasant licence (see the opening of Chapter 20 for her disapproving description of a carnival). It is at this juncture that I hear most clearly the voice of a moral Victorian lady as she wags an admonishing finger. One wholly commendable matter, however, is the author’s frank acknowledgement that not everybody is made for a life of stern moral purpose. This is seen in the novel’s sympathetic portrayal of Romola’s likeable, empty-headed middle-aged aunt Monna Brigida, whose sole concern is the fashions of the day. As a side issue, I note that Romola’s care for Tessa and Monna Brigida and for other women less intellectually endowed than she, often comes close to what I see as a subsumed yearning for motherhood on the part of the author. There are, however, many weaknesses in the structure of this story. Even more than in the average novel, coincidence plays a huge part. Tito’s abandoned stepfather just happens to arrive in Florence at the very time that it is right for Tito to be pursued and have revenge wrought on him. Later Tito just happens to be swept down the river to land exactly where nemesis is waiting for him. At one point in the novel, Savonarola just happens to meet Romola, when she is running away in disguise, and recalls her to her duty. Most egregiously Romola, attempting to float into oblivion, just happens to land at the village which needs her altruism. Perhaps the idea of a fate or “higher purpose” shaping our destinies is thematically important; but these are still jarring incidents in a naturalistic sense. In terms of narrative, the best element of the novel is the progressive revelation of Tito’s flawed character. His descent into moral torpor is so finely contrived that it is hard to tell at exactly what point we cease to sympathise with him. Indeed, to the very end, he still has attractive “public” qualities. And yet there is still that huge stumbling block of Romola herself. She is too perfect. Eliot never exactly makes Romola her mouthpiece. Most of Romola’s moral hesitations are reported rather than given as soliloquies, but even so, Romola is so prescient about the historical period in which she is living, is able to see “contemporary” events with such detachment and from such a rational perspective, that she becomes an idealised version of George Eliot’s favourite qualities. She is an Italian Renaissance woman wearing a crinoline. An intelligent, intellectual Victorian woman in the wrong century. This impression is reinforced by the clearly agnostic humanism in which Romola has been reared. I don’t want to be unfair to this very flawed and long novel. George Eliot imposes Victorian values and attitudes on Renaissance Italy much less than most current historical novelists impose current attitudes on the past. Even so, this is a very righteous and stately novel, out of tune with our age and unlikely to enjoy a revival any time soon. Fatuous footnote: As you may have noticed, I am very aware of the way established and “classic” novels are treated by film and television adaptations. Most of George Eliot’s novels have at some stage become intelligent BBC television series (Middlemarch, Daniel Deronda) or one-offs (Adam Bede, Silas Marner, The Mill on the Floss). Apart from a creaky 1930s British filming of The Mill on the Floss, however, none of them became movies for the cinema – unlike works by other Victorians like the Brontes or Dickens or Thackeray, all of which were much loved by Old Hollywood because of their broad popular appeal. George Eliot was clearly too intellectual, and therefore best left to the BBC. Oddly, the one exception is Romola. To the best of my knowledge, this has never been filmed for television. Not only is it somewhat obscure, but it would presumably also be cripplingly expensive to try to recreate the Italian Renaissance settings on film, even with the help of computer graphics. However, 90 years ago, Romola was Old Hollywood’s one stab at George Eliot. In 1924, a 2-hour-long silent version was made, directed by Henry King and starring Lillian Gish as Romola and her sister Dorothy Gish as Tessa (odd casting given the relationship of the two women in the novel). I have never seen this film, which seems to exist now only in a few archived copies, but stills suggest the approach which was taken. 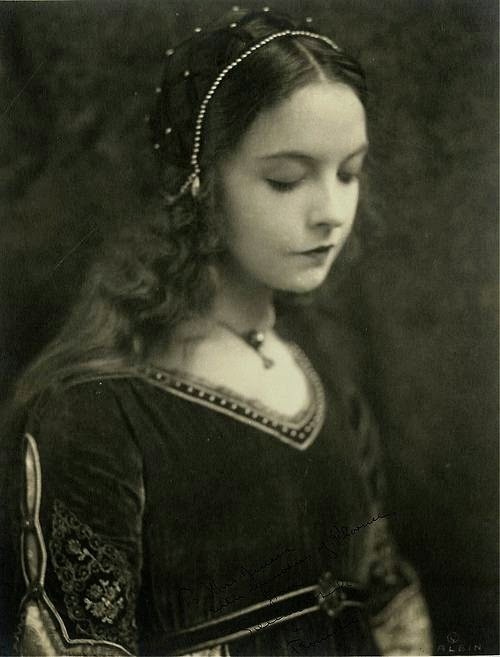 After all, Lillian Gish’s whole appeal was as the ethereal pure suffering virgin. So this was the 1920s idea of an “improving” and respectable classic. I would guess that the film would now seem even more dated than the source novel does.